A new school year is upon us and this means softball season is here! The Lady Vikings are gearing up for a fast and exciting year. An informative parent meeting will be held at 6:00 PM on July 23 at the EMS field (located in the Grand View field complex just south of the high school baseball field). Expectations, fundraising, and practice schedule will be discussed. Practice starts on July 24 (6-8 PM) with subsequent practices to be announced. Players need to bring a glove and plenty of water. To prepare for the season, it would be a good idea for players to start drinking lots of water now and get acclimated to the heat by getting some daily physical exercise outside. 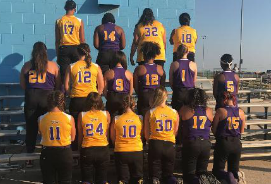 If you are interested in playing softball or have any questions, please contact Coach Anthony Cox at Anthony_cox@goodyear.com or call/text 580-704-6673. It's going to be a great season for the Lady Vikings!